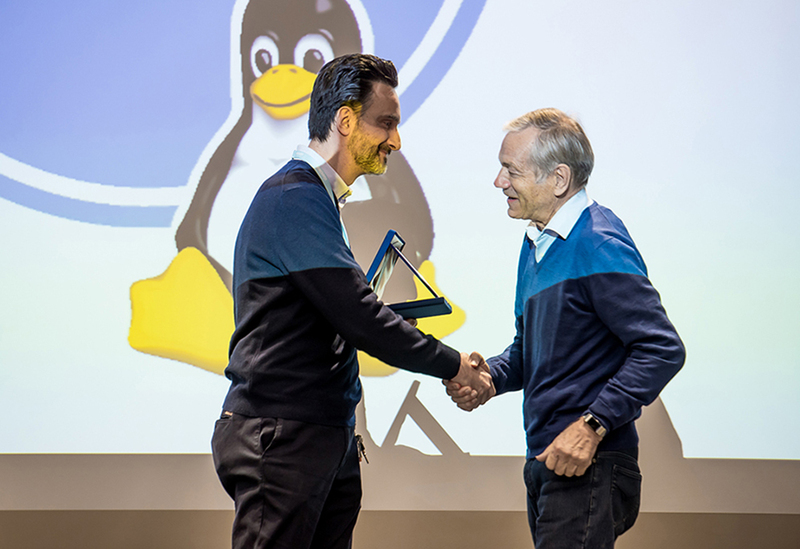 Free Software Award 2018 was delivered to Paolo Dongilli, who has been coordinator of the FUSS project, which gives students and teachers the opportunity to use at home the same “IT tools” they use at school, completely for free. “Hello everyone, my name is Markus, I am a member of the current board of the Linux User Group Bozen/Bozen/Bulsan. Today I am pleased to present you briefly the winner of this year’s Free Software Award. For many years, our winner has been actively promoting the dissemination of knowledge about Free Software and the benefits of using it. Our winner has been a major driving force behind the FUSS Project over the past two years and has secured his readiness for future challenges. Shortly, FUSS stands for free software upgrade at South Tyrolean schools. FUSS is a project started in 2005 that brought Free Software to all Italian schools in the province and is a complete Debian-based GNU/Linux solution (Server, Client and Desktop/Standalone) for managing an educational network. It is also a digital sustainability project that since 2005 has enabled students and teachers to use the same tools installed in the school free of charge at home. Our winner was motivational and a role model for all people involved in the project. He deserves the greatest respect for his humanity and conviction that mutual understanding and fairness among employees are prerequisites for every successful project. So this prize can be seen as a further incentive for his special kind of leadership. Another fact I would like to mention is the Open & Linux Schalter or Open and Linux & Desk. It is a free service for citizens who can get help installing free software and get help if they have questions about free software. The service is offered by volunteers and has been running for two years in the city of Bolzano. This month the service starts with the help of volunteers also in the cities of Bruneck and Merano. Our winner played an important role in the launch of this new service in Bolzano two years ago.